4 BR/4 BA Townhome - Spacious, comfortable, the perfect getaway! Our Construction is Over!!! New Knotty Alder Doors, Casing, baseboards, and hardware. We have skimmed all the walls and painted so everything is new and fresh! The new wood gives it such elegance and New automatic blinds, new fireplace, and all those comfy couches are the only things you need to relax after a long day on the slopes! Beautiful unit with everything you need for a great vacation! 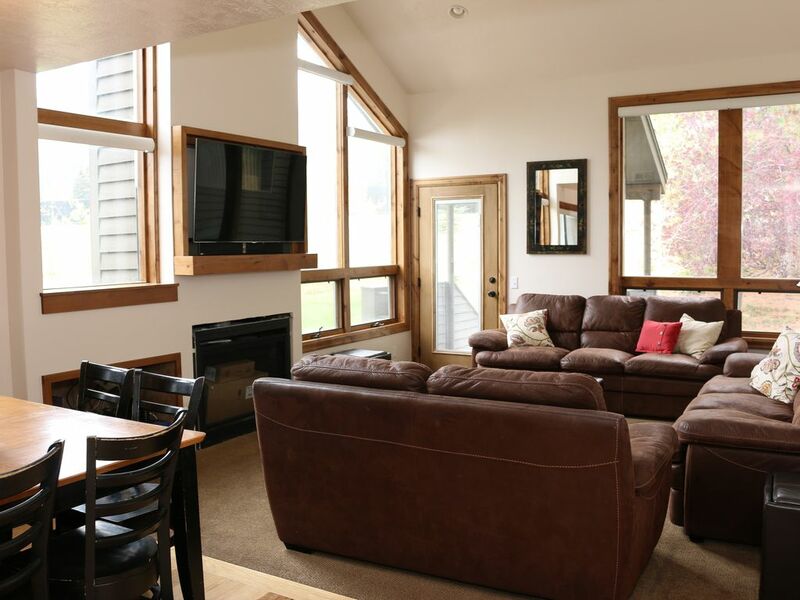 Unobstructed views of mountains, meadows, and the slopes round out this comfortable four bedroom, four bathroom, open tri-level townhouse, which is nestled at the base of the Wasatch Mountains in beautiful Park City. After a day on the slopes, come home to a cozy gas fireplace in the living room that heats the second and third level. BROADBAND CABLE INTERNET ACTIVITY INCLUDING WIRELESS INTERNET PROVIDED. The living room has a *42' Plasma screen TV with VCR, DVD and stereo/CD player. The plasma TV has all the connections for your computer or camera to review your day on the slopes with Comcast's On-Demand feature programing. There are 3 additional flat screen TVs in the master and lower bedrooms. The kitchen is tiled and completely stocked with all utensils, new stainless steel appliances, and cookware. The dining room will seat eight people and the breakfast bar seats four people. Private balcony with scenic view, an outside entrance for total privacy, and covered carport with two reserved parking spots. All bedrooms have a private full bathroom. *All bathrooms are remodeled with tile showers. Main floor bath has Steamer shower which is so relaxing after a day on the slopes. Master bath has gigantic bathtub wide enough for 2 to relax with pillow. All beds have new mattresses. The townhouse is in Red Pine at the base of The Canyons Ski Resort. Red Pine is a large condominium complex with approximately 24 buildings. The complex is quiet, well maintained and secure. It’s a short 2 minute walk to the clubhouse with an outdoor heated pool, outdoor hot tub, sauna, and extra large indoor hot-tub available to you during your stay. The Canyons Cabriolet or “People Mover” is just 0.2 miles away from the townhouse, a quick 60 second drive! The free shuttle is only a 1 min walk from the unit. Three miles away is Park City Mountain Resort and Deer Valley is 5 miles away. For summer visitors, there is a children's pool, four tennis courts, volleyball courts, and picnic area. Downtown Park City is two and a half miles south with shopping, 80+ restaurants, concerts, and cultural activities (Sundance Film Festival). Kimball Junction's Outlet Stores are located three miles north. Deer Creek, Echo, and Jordanelle Reservoirs provide boating and fishing. Many beautiful golf courses surround the Park City area. For the comfort of all our guests, this is a non-smoking, no pet accommodation. This is our vacation home. We love it, so will you. Hi! I'm Alex. My parents bought this Townhome here at The Canyons Townhomes over 10 years ago and I have been managing it for them since our first season. Darrell and Maryann are now in Austrailia for a few years while I am here locally holding down the fort. We love this area and live close to be able to enjoy it but want to share it with you. We have made it into exactly what a family needs and wants. We have owned in Red Pines for more then 15 years and have owned this unit for over 10 and love it. It is in a perfect location and is the perfect getaway. We hope you enjoy it as much as we do! We are in the perfect location here at The Canyons Townhomes. We are just down the street from The Canyons, an incredible resort. A few miles down the road is Park City with great skiing, shopping, and dining, and just a few miles the other direction is great shopping, dining, and home of the Utah Olympic Sports Park. There is so much to see and do and you are surrounded by some of the greatest skiing in the world! We are very family oriented and we know what a family needs and have provided everything for a family. We also know how important it is to be comfortable after a long day of skiing so we have gone to the Extreme to bring you that comfort! Whether you are a family or a group of friends getting together to ski we have what you need and we know you'll enjoy it! High Chair is located in upstairs hall room behind door. DVD player in only 1 bedroom and in living room. We had a great time at the condo during Spring Break, 2019. It was easy walking distance to the Canyons ski area and the space was well organized for a family group. Our stay here proved to be ideal in meeting all of our needs. The large area outside allowed for hours of fun in the snow for the young ones. It is a short 5 minute walk to the Canyons Cabriolet for all of the Skiers and Boarders in our group. The individual bedrooms were large enough to allow for privacy for those who wished to retreat from the group. The central areas are sizable and well apportioned to meet the needs of our group of 6 adults + 3 children with room to spare. There was an issue when we arrived and Alex addressed the issue personally with a swift and very professional response to make sure that our stay here was both memorable and enjoyable. We really enjoyed staying here. It was very roomy and well equipped and central to skiing and Old Town. My family and I stayed here in mid February for skiing. The place was great. We had so much room and it was nice after a day of skiing to have a jacuzzi and also a steam shower. The amenities were perfect. The place was quite clean and I would stay here again. Only a 5-7 minute walk to the people mover to take you to the lifts. This place is amazing lost of space super clean and comfortable I would 110% stay here again no questions asked. Alex is real nice, easy to get a hold of and very easy to talk to. This place was great for our 8-person ski getaway. We easily could have fit more! The kitchen was perfect, plenty of seating around the dining table, and the large TV was a lovely upgrade to watch the Superbowl on. The unit is just ~10m walk from the Canyons base area (a bit uphill), and ~5m walk to the Cabriolet (downhill, but wrong direction) which can take you up to the Canyons base area. Super convenient. The community HEATED POOL is just a few minutes walk away (close enough to walk in flip-flops and shorts in the cold!) and was truly lovely. I must include mention of the fact that upon arriving the entryway carpet smelled of mildew as did some of the beds. It seemed like for the beds, perhaps wet sheets were put on and were not given the opportunity to dry. We changed the sheets ourselves which helped with the smell, and I contacted the owner. They graciously allowed us stay an extra day, which allowed us to ski an extra day and pick up all of our equipment in the evening before heading out. Given the extra hospitality, I am not deducting any stars. Aside for the smells which I am confident the owner will have resolved, the bedrooms were clean and the beds were super comfy. Would stay again! Rates are subject to change until reservation is confirmed. Cancellations made 60 days prior to arrival result $100.00 fee. Cancellations made 45 days prior to stay forfeit 2 night's lodging, and cancellations made 15 days prior to stay (when entire fee is due) whole fee is forfeited unless unit is re-rented. If unit is re-rented you will receive a full refund less $200.00 fee.